Author and Lecturer | Laurel Corona » Blog Archive » How Do I Love Thee, Hong Kong? How Do I Love Thee, Hong Kong? Today when I was having dim sum at a crowded restaurant, I couldn’t help but overhear the conversation at the next table between an American couple and a Chinese one. To my surprise, the American couple were longtime Hong Kongers and their companions were new to the city. It was quite amusing to hear her giving Chinese people pointers about the city, and I learned through eavesdropping why viewing platforms in skyscrapers aren’t on the top floor. Fog. Don’t get a hotel room near the top either. Your “spectacular city view” may be of nothing but clouds. Most of the people are on the young side, although I have noticed Chinese people don’t seem to go gray until they are getting past middle age. The very old ones tend to be very small and have trouble walking without help due to what looks to me like scoliosis or rickets. I wonder what their stories are. Did they flee the Communist Revolution, as many did, to the safety of the British colony, or have they always lived here? What was their life like during the Japanese occupation? What was their childhood like and what do they think of the changes they have seen? I am horrified at how ignorant I am of Chinese history. I went to the Hong Kong Museum of History today (photo below) and learned so much, from the amazing geologic history of the area, through the original people, who were displaced by Cantonese who then shaped much of the culture. 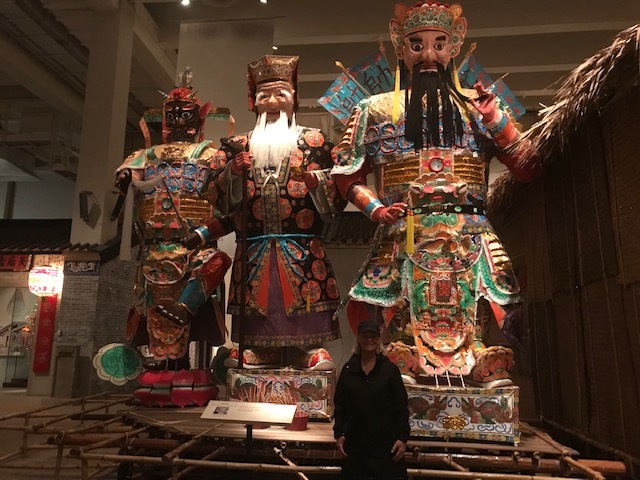 I learned in this amazing, state-of-the-art museum, with its beautiful replicas of festival paraphernalia and other folk art, about the various ethnic groups and folk traditions that underpin Hong Kong culture, every bit of it new to me. From barbecue at a street cafe, to buns from a bakery, to to dim sum in honor of the year of the pig, I have tried so many regional Chinese cuisines and all kinds of dishes, surrounded by the raucous chatter and laughter of a culture that seems to know a lot about how to enjoy life. 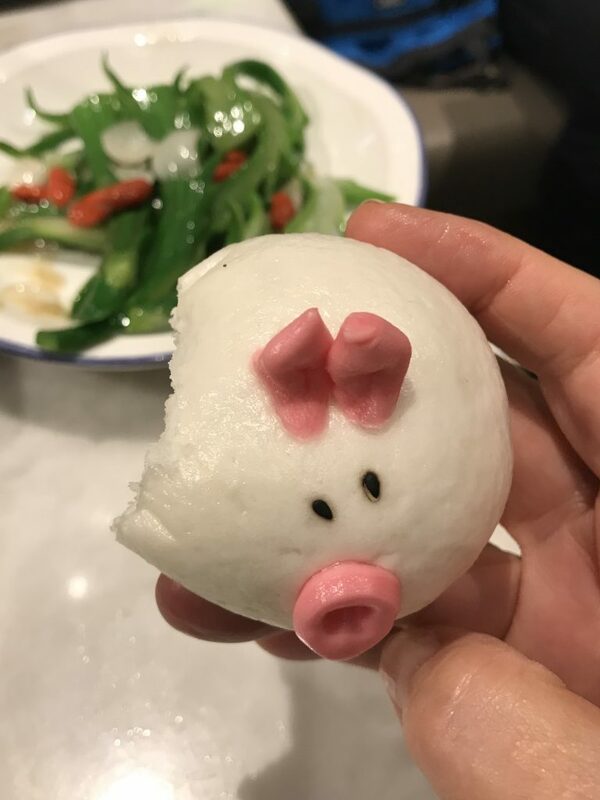 Case in point—well why not put cute piglet faces on cha su bao buns for the Year of the You Know What by Now. I walk my legs off in any city I am in, starting with a destination in mind, but preferring to let the day shape itself. Hong Kong has been great for that. While I had no idea where I was going, I discovered, among other things, that Hong Kong has these tiny pockets, often just around one street corner or one block. 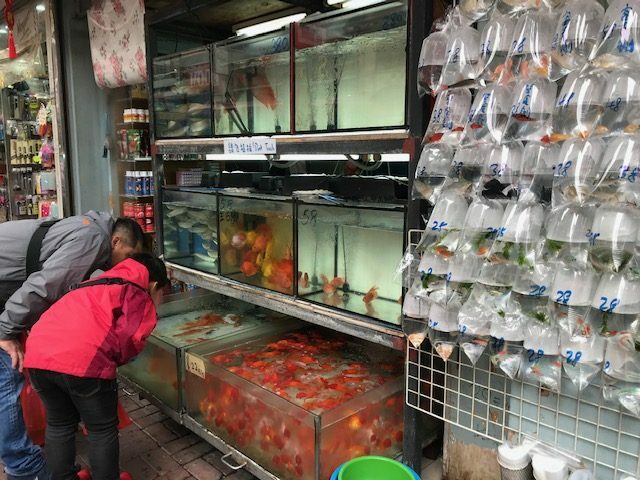 One might have just about nothing but shoe stores, and another, home renovation stores, and another a “goldfish market,”shown here, where people come to buy fish for their ponds and aquariums. Very feng shui, I am told. I do a lot of grinning ear to ear most places I go, but Hong Kong is extra wonderful. I was a little intimidated to take on a large city in a very unfamiliar culture, but it has been just wonderful! One more day here to explore Lantau Island, then on I go! I wish I could stay another few days at least, and will have to figure out how to make that happen. So much more to go see, and so many more opportunities to just wander. But for now, Singapore awaits! I have a few days there as well, before catching my next ship and so many more adventures to look forward to in places I have never been.